AT&T Wireless, at Wireless.ATT.com, offers cell phone plans and devices that millions of people take advantage of already. Switch to AT&T Wireless and find out why -- shop Samsung, LG, BlackBerry, or Palm phones, and find the package that is right for you. AT&T Wireless has refurbished phones for the discerning customer, as well as iPhones for those that love to stay on top of technological trends. 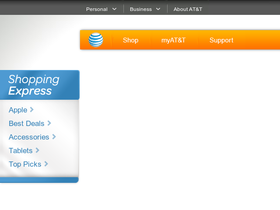 Or, if you enjoy prepaid phones, perhaps you would prefer a GoPhone from AT&T Wireless. Regardless of the package or phone you choose, make sure to see RetailSteal.com first for AT&T Wireless promo codes, AT&T Wireless discounts, and AT&T Wireless coupons. Get free 2-day priority shipping on cell phones and devices. Return equipment within 30 days of purchase for refund, and cancel service within 30 days from activation date to avoid early termination fee. Check website for full details. Bundle your services with AT&T and enjoy up to 25% in savings. Act now and enjoy up to $150 in rewards cards with your online purchase from AT&T. Check out the latest special offers and bundles available online from AT&T Uverse. Get U-Verse TV from ATT.com for only $50 a month. Get high speed internet as low as $30 per month at AT& T Wireless plus get a $50 reward card. Check out AT&T DirecTV and internet, now from only $80 per month. With AT&T you can enjoy a 2-year price guarantee on your service. Click link to sign up.